The Bureau of Labor Statistics said wholesale inflation rose in November for the second time in three months, led by wholesale services. Energy prices declined for the first time in three months. Excluding food and energy, the core Producer Price Index rose 0.2%. Year-to-year, which usually is a more telling measure, the index rose 1.3%, the highest in two years. The core increased by 1.6% in the same period. The Federal Reserve Board has been watching for inflation to increase as a sign that the economy is growing at a sustainable pace. With consumer spending accounting for more than two-thirds of economic output, the Commerce Department’s report on November retail sales showed shoppers letting up from recent consumption. Sales rose 0.1% for the month. However, only three of 13 retail categories reported declines, led by car dealers, in part because of lower pricing. 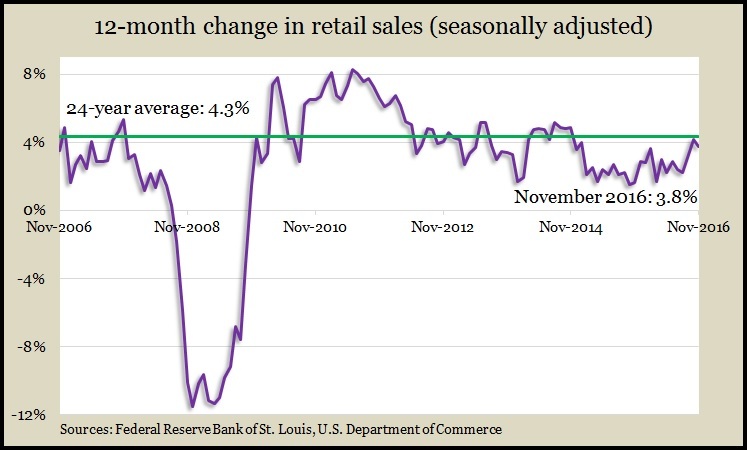 Year-to-year, retail sales rose 3.8%, down from the long-term average of 4.3% as the economy heads into the holiday shopping season. The Federal Reserve reported that industrial production fell in November for the third time in four months. Unseasonably warm weather in parts of the U.S. affected utilities production. The relative strength of the U.S. dollar also continued to challenge manufacturers. Capacity utilization, an indicator of inflation prospects, declined to 75%, its lowest level since March. In a sign that companies continue to whittle down excessive stockpiles to align them more with customer demand, business inventories fell 0.2% in October while sales rose 0.8%. The Commerce Department reported the ratio between inventories and sales declining for the second month in a row, suggesting companies are in a better position to respond to increased demand with more production and employment. As expected, the Federal Open Market Committee, the policy-making body of the Federal Reserve Board, raised the federal funds rate by one quarter of a percentage point. The move came two days shy of the one-year anniversary of the Fed’s first rate increase in nearly a decade. The central bank is trying to move credit rates from near zero, where they were meant to stimulate the economy. Further increases are planned, depending on how the Fed believes the economy is doing, based primarily on measures of inflation and employment. The broadest measure of inflation showed signs of economic growth in November. The Consumer Price Index grew 0.2%, led by a 2.7% increase in gasoline prices, the Bureau of Labor Statistics reported. Excluding the volatile food and energy items, the CPI indicated a 12-month inflation rate of 2.1%, the same as in October. The rate was as high as 2.3% in August. The moving four-week average for initial unemployment claims rose for the third week in a row, still hovering around 43-year lows. Data from the Labor Department showed jobless claims 28% below the 49-year average, where they have been every week for almost four years. The apparent reluctance by employers to let go of their workers suggests a solid employment market, which could fuel consumer confidence and spending. The departments of Commerce and Housing and Urban Development reported declines in the annual rates of housing starts and building permits in November. Both activities have been bouncing around pre-recession levels but remain far behind peaks from a decade ago. The pace of housing starts dropped 18.7% from October. Permits fell by 4.7%. Most of the declines were among multi-family houses. Housing economists have cited concerns about lack of supply both in new and existing homes for sale.